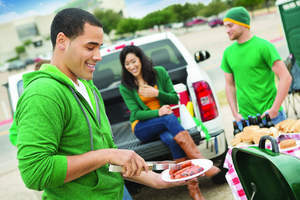 MISSION, KS--(Marketwired - Sep 18, 2014) - (Family Features) As football season kicks off, game day is a perfect time to show off your best spread while cheering your team to victory. From tailgating outside of the stadium to gearing up in front of the big screen at home, all fans alike can indulge in great game day snacks. Look for options that do double-duty on flavor and texture as these will save time and let you enjoy your favorite treats to the fullest. Answer appetites with apps. Even for a large crowd, an array of smaller dishes and appetizers can go a long way. A selection of finger foods lets everyone fill up on snacks of their choice without the fuss of a main dish that requires more prep. Be sure to keep in mind who you are serving. For instance, if a guest has dietary restrictions such as gluten intolerance or is vegetarian, several options or additional offerings to meet their needs will be much appreciated. Get grilled. Some of the most traditional game day eats, such as burgers, dogs or BBQ chicken, are best when grilled to juicy perfection. Focus on your grilling, and keep your side offerings simple by serving easy items like fruit salad or coleslaw. Add some crunch with ridiculously good chips, like Cape Cod's Kettle Cooked Sweet Mesquite Barbeque or Sweet & Spicy Jalapeño. One-pot wonders. Simple to throw together and serve, one-pot dishes, such as chili or stew, are perfect for a game day celebration and even easier when it comes to clean-up. Most require just a few ingredients, limited prep time, and setting to simmer. Offer a selection of toppings such as cheese and chopped onions, and invite guests to serve themselves to satisfaction. Go easy for the dip. The best way to enjoy your favorite party dip is with a chip hearty enough to stand up to its thick, creamy texture. Cape Cod's double-sliced Sea Salt Waffle Cut chips take on the dip challenge like a champ and are made with natural ingredients, gluten-free, and kettle-cooked in 100 percent canola oil. Your only problem will be figuring out which dip to sample first. Visit www.CapeCodChips.com or www.Facebook.com/CapeCodChips for more game day snacking ideas.